Located in Seminyak (Dyanapura), Pelangi Bali Hotel & Spa is within a 15-minute walk of Seminyak Beach and Double Six Beach. 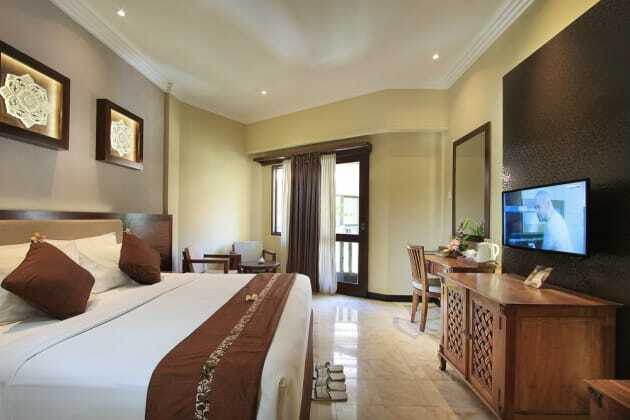 This beach hotel is 1.1 mi (1.8 km) from Eat Street and 1.4 mi (2.2 km) from Seminyak Square. Treat yourself to a stay in one of the 9 individually furnished guestrooms, featuring private pools and Smart televisions. Rooms have private furnished balconies or patios. Kitchens are outfitted with full-sized refrigerators/freezers, stovetops, and microwaves. Cable programming and iPod docking stations are provided for your entertainment, while complimentary wireless Internet access keeps you connected. Make yourself at home in one of the 287 air-conditioned rooms featuring iPod docking stations and minibars. Your room comes with a pillowtop bed. 42-inch LED televisions with cable programming provide entertainment, while complimentary wireless Internet access keeps you connected. Private bathrooms with showers feature rainfall showerheads and designer toiletries. Take advantage of recreation opportunities including an outdoor pool and a fitness center. Additional amenities at this hotel include complimentary wireless Internet access, concierge services, and babysitting/childcare (surcharge). Make yourself at home in one of the 16 guestrooms featuring minibars and DVD players. 32-inch LCD televisions with cable programming provide entertainment, while complimentary wireless Internet access keeps you connected. Private bathrooms with showers feature complimentary toiletries and hair dryers. Conveniences include phones, as well as safes and electric kettles. Enjoy a meal at the restaurant or snacks in the coffee shop/café. The resort also offers room service (during limited hours). Wrap up your day with a drink at the bar/lounge. A complimentary English breakfast is served daily from 6:00 AM to 10:30 AM. Make yourself at home in one of the 192 air-conditioned rooms featuring DVD players and LCD televisions. Complimentary wireless Internet access keeps you connected, and cable programming is available for your entertainment. Bathrooms have complimentary toiletries and hair dryers. Conveniences include phones, as well as safes and coffee/tea makers.